I’ve worked with many school districts who were moving to a 1:1 environment. Most of the time, they call it a technology integration- something teachers weave into their existing practice. Sometimes they call it an implementation- seen by teachers as one more thing to do. And sometimes it’s described more as an initiative- often seen by teachers as being done to them. Recently, however, a colleague (@tborash) and I had the opportunity to work with a school system who is calling it a technology infusion, and that description resonated with me. 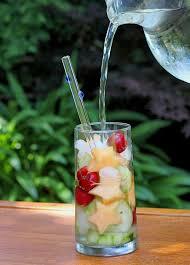 Have you ever had fruit-infused water? Maybe it’s something simple like squeezing a lemon slice into a glass of water. Maybe it’s a bit more sophisticated- with multiple fruits, cucumber, and mint sprigs. The effect is the same. The flavor is infused into the water. Even if you remove the fruit, the flavor remains. There is no separating the water from the flavor at that point. I think that illustration is what makes me like the term technology infusion so much. The students will all receive their own laptops. Teachers will receive training on teaching in a digital environment. They will all see how technology and curriculum are married. They aren’t separate parts of learning anymore. Digital instruction isn’t one more thing, but something that is infused within quality teaching. Infusing technology into instruction should change the instruction itself. Teaching and learning should move to be student-centered and student-driven. With means for engaging lessons, regular formative assessment, and real-time feedback, learning becomes blended and personalized for the student. You could remove the technology (but why would you want to?!) but the flavor would remain. What’s also interesting to me is that the concept of infusion could be used in so many different contexts. Talking with one colleague, I referenced that the district was engaging in a Model Classroom approach to job-embedded professional learning and that they had wanted to change the name to Infusion Labs instead of Model Classrooms. PBL, student-centered practice, Design Thinking- there are so many ways to think about the concept of infusion. The idea is the same – high-quality, student-driven learning. Drop whatever you want into the environment, and let it soak up the liquid. Let it replace the displaced water with flavor. Let it permeate the system. Infuse. My friend and colleague, Tony Borash collaborated on this post with me. Please check out his great work at http://tborash.wordpress.com. He’s also putting together a piece on how we process writing ideas together. This entry was posted in Education, Leadership, Professional Experiences, Technology and tagged 1:1, edtech, technology integration. Bookmark the permalink.